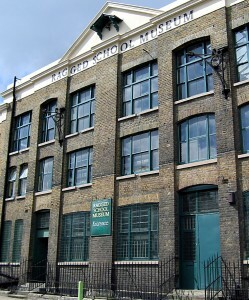 The Ragged School Museum is situated next to Mile End Park on the towpath of the Regent’s Canal. The entrance to the museum is on Copperfield Road – it is not always possible to enter the museum via the towpath. The nearest tube station is Mile End (Central, District and Hammersmith & City lines). On leaving the station, turn left and walk to the crossroads. Cross over towards the bridge and, before the bridge, turn left and head through the park. The nearest DLR station is Limehouse. 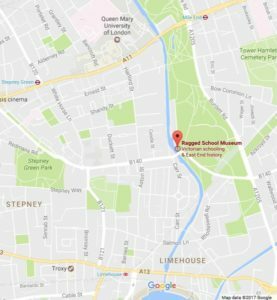 The museum can be reached by heading north on the Regent’s Canal towpath. There are numerous bus routes you can take to the museum. 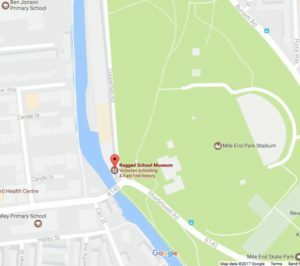 These include 277, D6 & D7 (stop at Eric St, head through the park), 25 (Regents Canal, head through park), 339 (Harford St, head east up Ben Jonson Rd), 323 (Bow Common Lane, head through park) and 309 (Copperfield Rd, just over the road!). The nearest rail stations are Liverpool St and Stratford. You will need to take the tube or a bus to continue on to us. Most of us are cyclists at the museum, so we encourage people to get on their bikes! There are Bike Hire stations on Aston St, Harford St and Mile End Rd. There are cycle racks behind the museum, on the Regent’s Canal towpath. See the TFL website for more travel details and the latest updates!